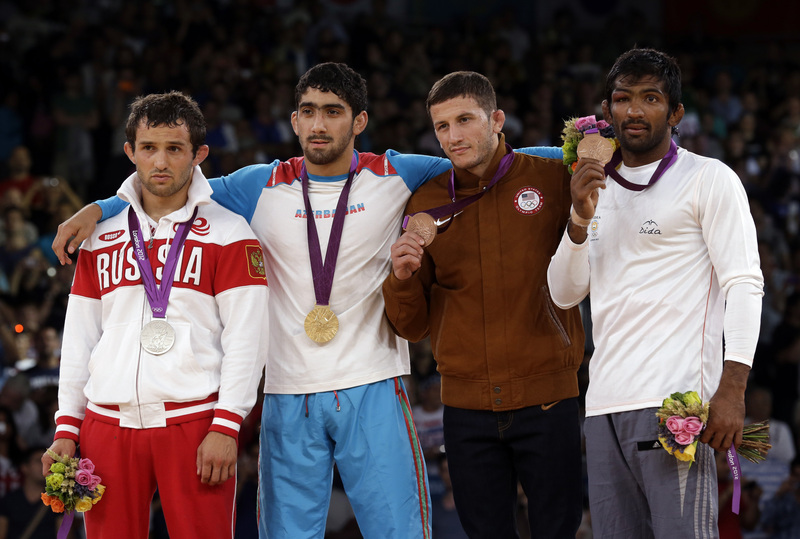 Yogeshwar Dutt (extreme right) always had tremendous respect for Besik Kudukhov (extreme left). The Indian wrestler’s large-heartedness trumps the best diplomacy. When the announcement was made in July that Russian track and field stars were banned from the Rio Olympics, the ‘us against the world’ mindset that many Russians harbor was reinforced. I remember hearing conversations in bars in Moscow about the politicization of sports and how unfair it was that the Russian athletes were banned from the Olympics. The Russian athletes who were banned from participating in Rio have their own side of the story, something that has been largely ignored by the western press, which is keen on demonizing Russia as a whole. Freestyle wrestler Besik Kudukhov, who won the silver in the 2012 London Olympics, unfortunately cannot defend himself against allegations that he took banned substances. He died in a car crash a year and a half after he won the Olympic medal. Of course, the International Olympic Council is not going to pay heed to Dutt’s sentiments, but this sincere gesture shows the kind of person the Indian wrestler is. In a world where a disgraced person is forsaken even by loved ones at the blink of an eye, Yogeshwar Dutt showed that there is still compassion and humanity. Sport goes well beyond narrow nationalism and politics. It’s about discipline, dedication, determination and sacrifice. Any athlete that has reached the level of excellence to represent his or her country knows what it takes to defy odds and overcome obstacles in the face of stiff opposition. The 33-year old from Haryana paid tribute to his Russian counterpart, calling him a great wrestler. Besides winning two Olympic medals, Kudukhov was a four-time world champion. He had a very promising career ahead of him before his tragic death at the age of 27. After hearing from my Russian friend about Dutt’s gesture, I checked out the tweets in Hindi and then did a quick scan of the Russian media to see their coverage. The news made it to websites in smaller regions and even some Russian bloggers wrote of Dutt’s sporting spirit. One small gesture from the Indian wrestler managed to win hearts in a country that feels that it has very few friends in this world. If anything, Dutt added to the goodwill and soft power that India enjoys in Russia. Athletes, artists and even businesspeople have the ability to do far more for India-Russia relations than the finest of diplomats. Dutt’s warm-heartedness could be used as a catalyst for greater sporting cooperation between the countries. Russia has a great and winning tradition in wrestling. India should look at ways to promote exchanges with Russian wrestlers and hold bilateral competitions to help it prepare for international events. The holier-than-thou attitude that the western press has displayed around Russia’s doping scandal is laughable. Drug cheats, whether they act on their own or not, are always a step or two ahead of the system. Winning an Olympic medal is a question of centimeters, tenths of a second or just one extra ounce of strength. No one really knows for how long athletes have been using performance-enhancing drugs to get over the hump. History rarely remembers those who finished fourth or fifth in the Olympics. Unlike what the western media would like the world to believe, doping is by no means just a Russian or Chinese problem. From track stars like Canada’s Ben Johnson to baseball players who took steroids right until a few years ago, western countries have their fair share of cheats who were caught, and others who managed to beat the system and protect their reputations and legacies. The World Anti-Doing Agency (WADA) has made many an attempt to stop doping but there will always be ways to get around. As long as sports are associated with so much prestige, money, power and of course nationalism, there will always be people and countries that try and get that ever- slight advantage over the competition. I am not calling for the legalization of performance-enhancing drugs but I honestly see no foolproof system anywhere. Unlike India, Russia is not starved of sporting heroes but the latter is just as passionate when it comes to honoring its champion athletes. Although Kudukhov did not win a single Olympic gold (he won the bronze in Beijing and silver in London), he was chosen to be one of the torchbearers of the Sochi Winter Olympics torch relay.